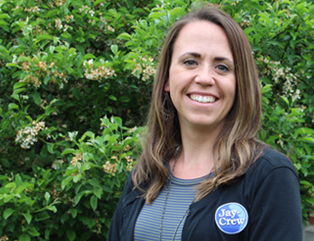 Hello, my name is Amanda Goad and I began working as the Office Manager at Jay-Crew in January 2011. I have a number of responsibilities around the office including billing, processing, and payroll, accounts payable/receivable. I graduated from Ball State University in 2005 with a degree in Marketing. Since graduating, I have held a few positions in different industries including finance and insurance. I found that through all my experience in other positions, I enjoy my current position at Jay-Crew more than anywhere else. I enjoy the interaction I have with our customers that visit our office and who I speak with on the phone. I have learned a lot about our industry from my co-workers, and they help to make each day at the office enjoyable. I am happily married to my husband, Derrick. We have two daughters named Bristol and Jillian, and we currently live in Muncie. Outside of work, I enjoy spending time with our family and friends, working in the flower beds at our home, coaching volleyball, and playing with our two dogs, Remi and Gracie.